Some pond plants are better suited to deeper conditions, growing in less sunlight, colder water, and higher pressures. Plants, whether terrestrial or aquatic, are incredibly diverse and each species is typically best suited to a particular environment with particular conditions, known as an ecological niche. With this in mind, there are five accepted plant water zones when it comes to lakes and ponds. Zone one contains floating, unrooted plants such as duckweed that are typically only found on the surface of the water. Zone two is comprised typically of emergent plants that prefer pond edges without standing water (but still have saturated soil), such as some rush species, sweet flag, and so on. Marginal or bog plants that prefer some water (only a couple of inches deep) such as water iris, marsh marigold, cattails, and horsetails grow in zone 3. Plants that prefer water ranging from about 20 to 40 centimeters in depth are in zone 4. 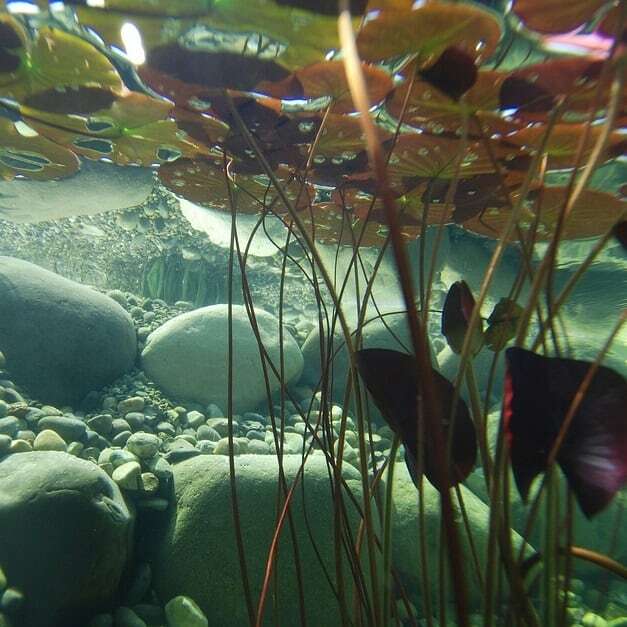 Zone five is home to the deep water plants (also known as deep emergent), which are those that prefer water depths of 40 centimeters (about 1.3 feet) or more, typically growing at the very bottom of the water body, either totally or partially submerged. What Makes Deep Water (Zone 5) Plants Different? These deep water plants are adapted specifically for this area, and as such are able to survive conditions that might kill other plants such as reduced sunlight, colder water temperatures, decreased oxygen concentration, and higher water pressure. 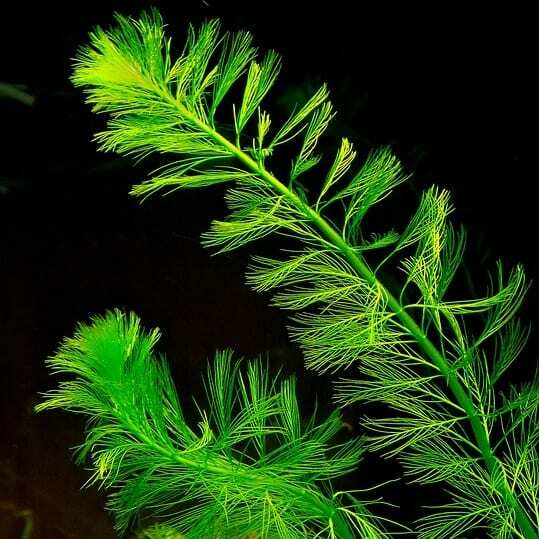 Deep water plants respond to limited sunlight by pumping out more chlorophyll, which is the molecule responsible for capturing sunlight for plants. Deep water plants often produce more chlorophyll, have smaller leaves, and even have slime coats to reduce underwater drag. In addition, submerged deep water plants tend to have smaller leaves or lack them altogether; if there is a change in water movement, these small leaves will not catch as much resistance as larger leaves would, and therefore help prevent the plant from moving about or being fully uprooted by the movement, whether it’s caused by a passing fish, living in a fast-flowing river, or a water pump. Many of these plants (such as water lilies) also have a coating of slime, which reduces the amount of drag from water movement, instead allowing the water to flow more smoothly around the plant. This coating also helps deter predators. In addition, the greater the water depth, the smaller the plant tends to be overall, having fewer shoots and nodes (but those that do exist tend to grow longer) in response to reduced oxygen and sunlight availability. This type of phenomena is known as the principle of allocation, which is when an organism has limited resources and must allocate them wherever the greatest potential payoff is, and no matter the choice there is some form of tradeoff. Deep water plants include species within the categories submerged, emergent, and some species of bog, or marginal, plants. Here we will cover a few deep water plant choices from each category. Submerged plants are those that begin growth beneath the water’s surface, with all or most of the plant remaining beneath the water throughout its life. Some submerged plants may produce flowers and leaves that float atop the water’s surface while the bulk of the plant is at the bottom of the water body. One of the most well-known submerged plants, water lilies are incredibly hardy, able to subsist even during cold winters by storing energy in their thick rhizomes and then using that energy to sprout new growth in the spring. While water lilies can grow in depths of up to ten feet, it takes time for them to reach this point. Your best bet would be to grow some water lilies placed in pots in shallower water (about 3 feet in depth – remember, “deep water” in ponds is considered 1.3 feet of more) and once they mature and are doing well, you can gradually move the pots out by a few inches every couple of months so long as they are growing enough that the uppermost leaves float atop the water’s surface. Hornworts, also known as coontail, are able to grow in depths ranging from a few inches to over a meter, and are considered one of the most adept water oxygenators due to their abundant tiny horn-like leaves (hence their name). In addition, these plants are able to tolerate shade better than many other submerged plants, making it ideal for deep water ponds and lakes. Hornworts don’t have to be rooted into a substrate (though they can be), because they obtain nutrients from the surrounding water rather than from sediment. Photo by Vahe Martirosyan, available under a Creative Commons Attribution 2.0 Generic (CC BY 2.0) license. Broad-leaved pondweed is able to grow in depths of 6 inches to 3 feet, its growth pattern similar to that of water lily in that it roots itself at the bottom of the water, produces tall leafless shoots that reach to the surface of the water, and then yields oblong leaves that float atop the water. These broad leaves provide oxygen, soak up sunlight for the rest of the plant, and provide spawning and cover habitat for fish. Also like water lily, it can grow out of control so you may want to place individuals in pots placed at the bottom of the pond to prevent them from overtaking the ecosystem via spreading rhizomes. Emergent plants are those that like to be partially, but not totally, covered in water. For the purpose of this particular article, the plants in this category are considered deep-emergent. A truly beautiful plant, sacred water lotus produces vibrant, fragrant, large colorful flowers typically from June through August. It can grow in water that is anywhere from about one foot to 8 feet in depth, with shoots that will extend beyond the water’s surface by over a foot, each shoot with one dinner plate sized leaf and one flower. It needs muddy substrate that is at least 4 inches deep to root itself into. However, this plant is native to Asia and therefore is deemed invasive in portions of North America and Europe. Be sure to check that it’s legal for you to have this plant where you live, and take care to not plant it near natural water bodies where it may escape to and cause immense damage. An alternative to the sacred water lotus is the American water lotus, which is similar in both appearance and habitat requirements. Claimed by some to be second only to water lilies in terms of the best deep water plants, water hawthorn grows best in 30 to 90 centimeters of water. Native to South Africa and thus fairly hardy, water hawthorn will flower all year unless weather is too hot (above 80° F) or too cold (below freezing), so you’ll be able to enjoy its pleasant vanilla aroma from late winter to late autumn. This plant produces oblong leaves that float on the water and shoots with flowers that extend several inches above the water. It’s able to grow well in any light level, whether full shade or full sun. With varieties that are native to Europe, Asia, and North America, arrowhead is generally a good choice regardless of your location so long as you live within hardiness zones 6-9. They often grow naturally in ponds, canals, and other slow-moving waters that are 30 to 60 centimeters in depth and can reach over 3 feet in height. This combined with their hardiness (they can survive temperatures as low as 14° F, or -10° C) make them ideal for deep water ponds and lakes. The tubers are edible, and can be cooked and consumed. Marginal plants are those that generally prefer to grow on the water’s margin, either in some water or simply in saturated soils. Some species, however, are adapted to live both on the margins as well as in deep water. Cattails are well adapted to be able to grow simply in marshy, heavily saturated soils or as much as 60 centimeters of water, so they’ll do just fine in a deep water pond or lake. Depending on the species and your location, some cattails can be invasive so be sure to check for you area to determine which species (if any) are native in your area. To prevent them from overtaking the area, you should plant them in pots in partial shade to full sun, gradually moving them to deeper water if you wish as they grow taller, and keep in mind that they may grow to near 10 feet in height. Photo by KENPEI, available under a Creative Commons Attribution-Share Alike 3.0 Unported license. Growing anywhere from 3 to 5 feet in height, bur reed does best in either damp soils or water that is 20 to 60 centimeters deep. Erectum is native to Britain, while Americanum is native to North America. 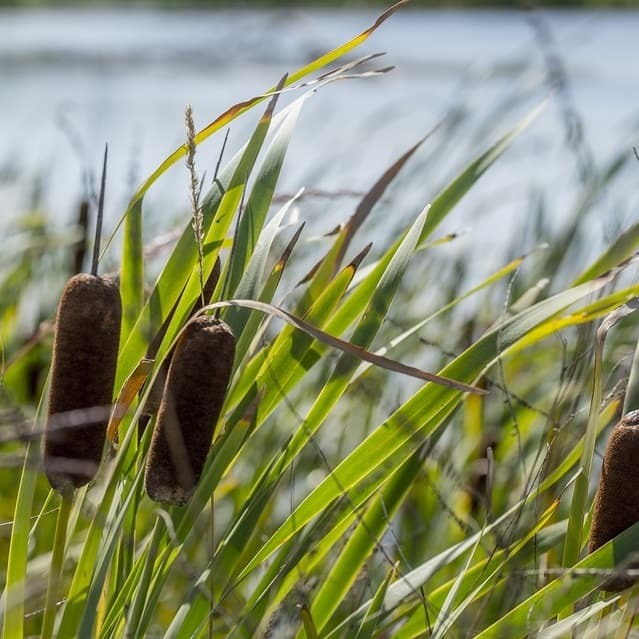 Bur reed produces unique, spikey ball-shaped flowers that are valuable to pollinators, and the portions of the plant that are below ground provide ample habitat for fish and aquatic invertebrates. The seeds are fed on by waterfowl, and overall this plant is considered quite valuable to wildlife. Native to the majority of Europe as well as the U.S., watercress can grow in water depths of up to 60 centimeters. It’s excellent at removing nitrates from water through a process known as phytofiltration, provides oxygen, and is edible for fish, other wildlife, and humans alike. Watercress can grow from 50 to 200 centimeters (1.6 to 6.5 feet) in height, and grows well in partial to full sun.